NASA is eyeing future expeditions to Mars, relying on efficient transportation technology. 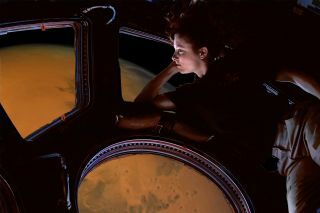 This artist's illustration of a NASA photo shows how the view of Mars might look like to future astronauts. Microorganisms from Earth could hitch a ride on spacecraft and end up colonizing the Red Planet and other celestial bodies in the solar system, recent research suggests. The new research has implications for the search for life in the solar system: If Earth's microbes can survive the perilous journey to other planets and moons, it may be difficult to determine whether any microbial life discovered on those bodies originated there or was introduced from Earth, scientists say. However, research detailed in three studies published in the journal Astrobiology in 2012 suggest that the current bioburden standard isn't set high enough, because some microbes are far hardier than expected. In two of the studies, scientists tested the ability of the spore-forming bacterium Bacillus pumilus SAFR-032 — which has a high resistance to the ultraviolet (UV) radiation and peroxide used to clean spacecraft — to survive in space. (One study also looked at another spore-forming bacterium, B. subtilis 168). Using the European Technology Exposure Facility (EuTEF) mounted on the International Space Station, scientists exposed the bacteria to a simulated Mars atmosphere. They also subjected the bacteria to various space parameters, including space vacuum, solar radiation and intense temperature fluctuations. "To our surprise, some of the spores survived for 18 months," Kasthuri Venkateswaran, a researcher with NASA's Jet Propulsion Laboratory in Pasadena, Calif., and a co-author on all three papers, said in a statement. A mission to Mars would take less than half that time, spaceflight experts have said. Surviving B. pumilus SAFR-032 spores also demonstrated elevated levels of proteins associated with UV resistance, the researchers said. Given that UV radiation is a big threat to space-living bacteria, the researchers believe that spores sheltered from solar radiation, such as those living under spacecraft structures, or mutant subpopulations with heightened UV protection, could possibly survive a trip to Mars. In the third study, Venkateswaran and his colleagues tested the survivability of rock-colonizing cellular organisms on the EuTEF. Some of the organisms lasted the full 18 months in space. The results suggest that rocks ejected from a planet due to a meteor impact could possibly carry rock-colonizing organisms to other planets (though it would take thousands to millions of years for the rocks to reach another planet).